Havana is Cuba’s most populous city and serves as its booming capital which mixes both old and new world elements to create a sprawling metropolis. Here is just a selection of our favourite and cheapest hotels in Havana. Please use our search panel above to find your perfect choice. 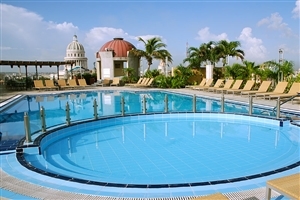 Enjoy the opportunity to relax in a prime location in the Cuban capital Havana with a break at the four star H10 Habana Panorama. 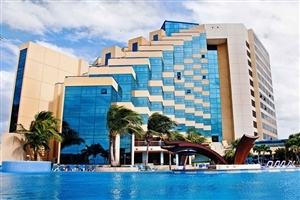 Situated in the heart of the Miramar district, the hotel provides guests with stylish accommodation that looks out across the city or the sea, and provides ... easy access to the delights of Old Havana thanks to a free shuttle service; making it the ideal option for anyone wishing to discover more about this fascinating city. 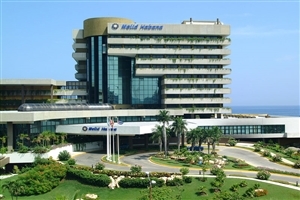 If you are looking for some five star luxury during your break in the Cuban capital than look no further than the Melia Habana, a stylish hotel located along the Havana coastline. 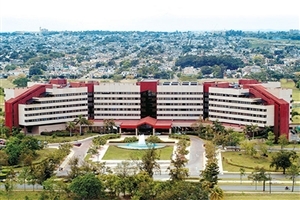 Surrounded by lush tropical gardens, the hotel can be found in the Miramar district of the city but ... offers easy access to the delights of central Havana, with stylish and luxurious accommodation, a mix of culinary options and a plethora of facilities – including one of the largest in the city – awaiting those who check in. Situated in the heart of Havana, the Iberostar Parque Central is a five star hotel that is famed for its impressive colonial style architecture and its rich culture – which have helped to make it one of the most popular hotels in the Cuban capital. Close to the major tourist ... sites, the hotel provides a range of stylish accommodation that offer luxury and comfort and unrivalled views of the city landscape, including from the rooftop swimming pool. The Memories Miramar Havana sits in the heart of the Cuban capital with views across the ocean and provides easy access to the main highlights of the city – such as Old Havana and the Club Habana Beach. Offering guests a selection of impressive accommodation options, the four star hotel ... offers a stylish base and features a choice of restaurants and facilities for all the family.